After Amstrad purchased the Spectrum from Sinclair in 1986, they relaunched the popular ZX personal home computer as a Spectrum +2 model with 128K RAM a year later. 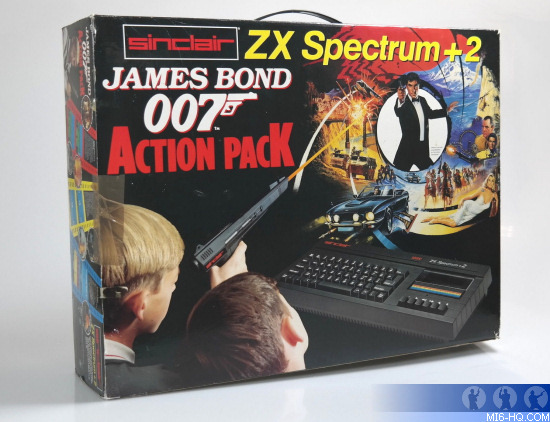 To capitalize on the Christmas season in late 1989, Amstrad bundled the Spectrum +2 with three James Bond games and a light gun and dubbed it the "James Bond 007 Action Pack Edition" for £159. The main game in the bundle, 'The Living Daylights' was originally published in 1987 and renamed 'Mission Zero' for this release. The other two games included were Magnum Light Phaser exclusive titles 'Q's Armoury' and 'Lord Bromley's Estate.' Although no documented history of the development of those latter two games exist, it is safe to assume they were generic lightgun games developed by UK software house Divide By Zero to sell the Spectrum's lightgun that were quickly rebranded and published by Domark to suit the theme of the James Bond Action Pack. 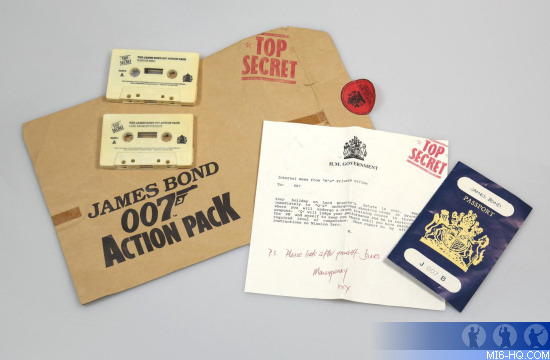 The pack included a 'Top Secret' briefing envelope which contained two cassettes, a memo from 'M' and a toy replica of James Bond's passport. The first cassette contained 'Lord Bromley's Estate' on one side and 'Q's Armoury' on the reverse. The second tape contained 'Mission Zero' ('The Living Daylights') and on the reverse a special audio recording. What makes this release particularly interesting is the re-writing of Bond history. Desmond Llewelyn was hired to voice audio introductions to each game on the audio cassette. A new original backstory was written which would lead up to the game 'Mission Zero' (AKA 'The Living Daylights') and re-cast the film's central villain Brad Whitaker as a member of a shadowy organisation dubbed 'SPIDER' (obviously a spin on SPECTRE to avoid rights issues). True to the roots of many a Bond adventure, this new backstory story sees the death of a fellow double-0 agent and 007 unravelling a conspiracy during a sporting activity. First up, 'Lord Bromley's Estate' is a clay pigeon simulator. Llewelyn reads Bromley as 'Broccoli' throughout on the audio cassette, indicating the title was originally a nod to producer Albert R. Broccoli and then later changed prior to publication. A relic of the time this was produced, phrases like "swamped by foreigners" would not be considered politically correct today. "Bromely's got some pretty important guests there: a trio of cabinet ministers and several ambassadors. I'm sorry 007, but you weren't invited just to enjoy the country air. Now, 002 has reported has reported strange happenings along the Turkish coast. About a week ago, a tiny little fishing village was swamped by foreigners. They're a mixed bunch, all nationalities, but they knew each other and he heard them talking about low-level helicopter flying. He's definitely on to something, but we don't know what. His body was washed up yesterday in the south of France, almost 2,000 miles from where he was last seen alive. Now I'm sure you can see the urgency of the situation. Bromley's playing host to some of the most important people in Europe and we can't take any chances. So, keep your eyes open 007, and if anything untoward should happen... well, I'm sure you'll deal with it with your usual efficiency." At the end of this game, it is revealed that 007 has stopped the European ambassadors from being assassinated during the clay pigeon shoot. Second up is 'Q's Armoury' (also known as 'Q's Shooting Range' and 'Q's Underground Shooting Range') which is a simple firing range simulator where targets pop up worth different amounts of points depending on their difficulty and frequency. This is a simple training exercise for the lightgun dressed up with more backstory. Interestingly, a feature similar to the signature gun as featured in 'Licence To Kill' that summer is mentioned here (although totally fictional - the lightgun would work for anyone) and would return over 20 years later in 'Skyfall.' 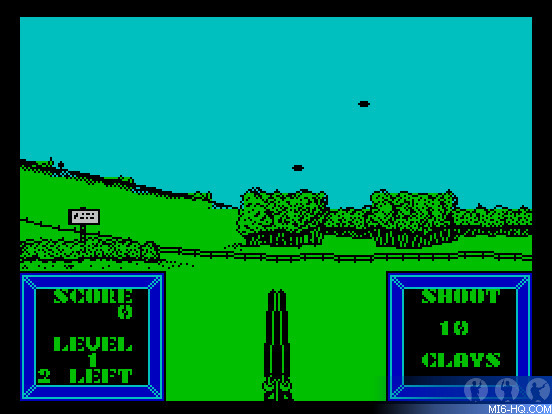 This game consists of three similar levels in the shooting range, with the mode of the lightgun changing in each. "Ah 007, thanks for getting down here so quickly. You know we were right! The crew of the chopper reads like a roll call of international terrorists - four of the most dangerous mercenaries on our files. It'd take something huge to bring those four together, and our man in Turkey reported a whole army of suspicious types. Well you better sit down... No! No! Not there. That's a prototype we're working on - an ejector seat for top ranking officials. If someone tries to assassinate them at their desk, it shoots them to safety through a trap door in the ceiling. Only, we don't have the trap door fitted yet. You know, it would have blasted you against three inches of concrete at 100mph. Even you'd have got a headache from that. Right, back to business. Now, there's only one organisation powerful enough to recruit terrorists of these capabilities. An organisation called SPIDER and their aim is obvious: if they'd killed those ambassadors on British soil, imagine what it would have meant to the peace talks next month. We'd have been back at the iciest depths of the Cold war! So, we're sending you in." "You must eliminate SPIDER's threat before they try again, and it's going to be tough, possibly your toughest assignment ever. So, we've devised something to give you an edge. Now, this may look like an ordinary pistol, but it's not. Firstly, it's electro-genetically personalised so only you will be able to use it. Now, I want you to hold it while I set it. [Beeps] There, that's it. Now, you're the only person able to use it. Take it out to the firing range and get used to it, blast those bullseyes, and... piece of cake really, 007. But, pay attention as this is actually three weapons in one. In your second visit to the range, you'll use it in continuous fire mode. That's right - hold down the trigger and you've got a machine pistol. Pretty neat, hmm? And finally, the heavy artillery. Well, you can't really lug a bazooka around with you, so we've devised a miniature explosive shell. Its effects are devastating. It can blow holes in armour plated steel! Now, that'll be your third session at the firing range. Sorry to put you through all this 007, but M insists. Oh, and you don't leave here until you've reached the qualifying scores in each category. Well, what are you waiting for? Get shooting." 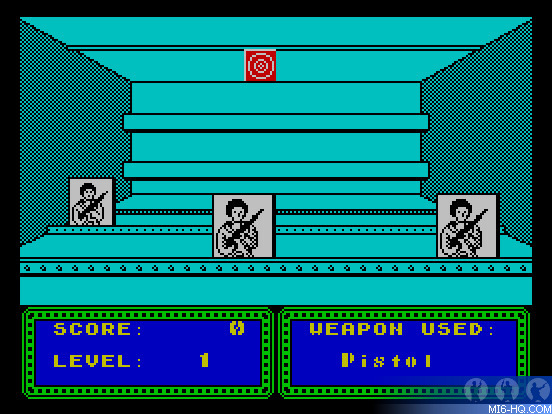 Upon successful completion of the three shooting range modes, the player is prompted to continue the story and move on to the final game which is the re-release of 'The Living Daylights,' but not as you may know it. In the 007 Action Pack, the game is renamed 'Mission Zero.' The backstory that's been leading up to this point re-writes the mission for Bond, and Brad Whitaker is turned into a leading member of SPIDER. They almost pull this off as the game as originally developed two years earlier was light on the movie story details. 'Mission Zero' / 'The Living Daylights' Spectrum screenshots. "Well done 007. I knew you could do it. It's a nice weapon, isn't it? Well, you're going to need it. While you've been on the firing range we've uncovered what SPIDER's really up to, and it's far worse than we first thought. They are going to mount an all-out attack on the peace talks next month. In the confusion that follows, they'll cease military power in three of the world's most unstable countries. They'll hold the East and the West to ransom. Overnight, they'll turn from being a counter-espionage organisation to a major political power. Now, fortunately, we've located their headquarters, but it's fortified beyond belief. To avoid raising the alarm, you'll have to go in alone. I don't have to tell you how dangerous that's going to be. You must infiltrate their base swiftly and silently, shooting anyone who gets in your way before they have a chance to raise the alarm. Now, you're going to need every bit of accuracy you've demonstrated on the target range, and a bit more. Now, we don't quite know what you're going to find in there, but sources say there are eight levels before you come face to face with their leader in his inner sanctum. You must use whichever of the gun's modes is most suitable for each situation. Get it wrong and you're as good as dead. But you won't need the gun all the time. Grab whatever you find in there to get you to that final level. Right, now your mission briefing is waiting. Read it carefully but don't waste time! The future of world peace depends on you. And James, I don't need to say it, but, good luck... You'll need it." Despite two of the titles being generic lightgun games with only the slightest of 007 touches, and the main title being renamed from 'The Living Daylights' to 'Mission Zero', the James Bond 007 Action Pack was a huge sales success. Since Amstrad had taken over, the focus was on selling the Spectrum was purely as a games machine. Creating a rich backstory for what are essentially training games and a re-release title, shows genuine effort in the marketing of the bundle, complete with a memo from M and James Bond's passport. 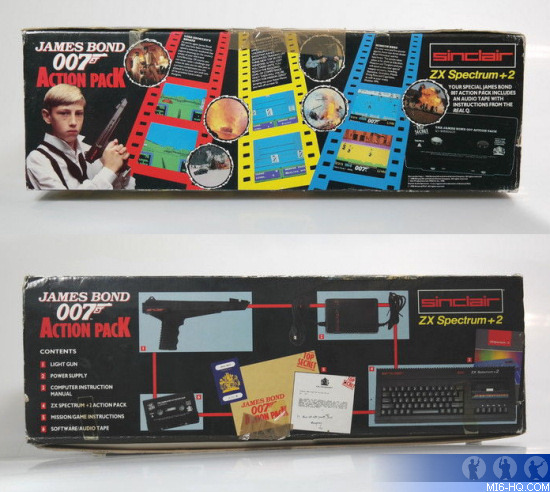 Many children woke up to a James Bond 007 Action Pack under their Christmas tree that year, and (not accounting for inflation) complete sets typically sell for more now than they originally cost 25 years ago.